SAN ANTONIO — Sione Teuhema was so busy relocating someone else’s life that he missed the call potentially changing his. He and his co-worker, Jerry, had a job to complete as movers for Two Men and a Truck in Houston. Bills needed to be paid. Teuhema packed up the truck, then rode along as Jerry drove to the customer’s destination before they unloaded the contents into the new home. The phone call went to voicemail. Only after the move did Teuhema listen to the message from Phil Savage, the GM of the Arizona Hotshots, and tell Jerry about it. Teuhema quit the moving job two days later. 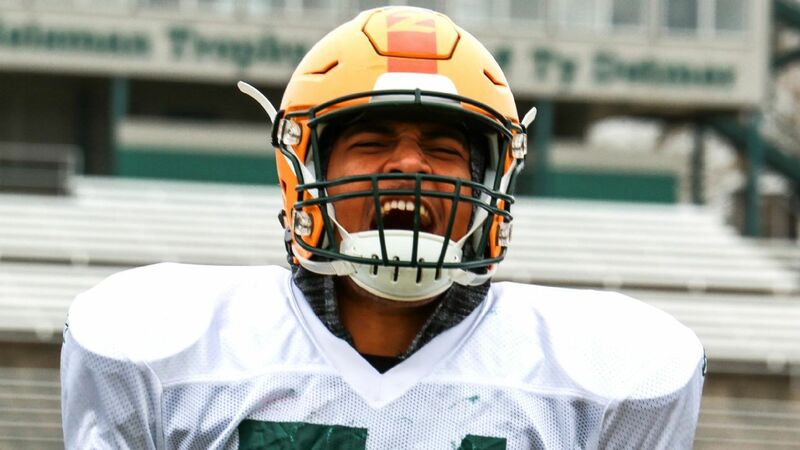 The Hotshots secured Teuhema’s rights in the player allocation draft of the Alliance of American Football, which kicks off its inaugural season on Saturday. The linebacker is the type of player for whom the AAF was created. He spent two years at LSU, was kicked off the team — for “a couple off-field incidents,” he said — and resurfaced with the Southeastern Louisiana Lions. He went undrafted in 2018 and participated in rookie minicamps with the Chicago Bears and the New York Jets. He wasn’t signed. He figured football was done and found a job. After a month or so, Savage called. The AAF is a league of first chances and last chances, of comebacks and closure. Of finding a way to keep playing football and creating depth the NFL doesn’t have time to develop. Who’s in this new league? Where can I watch? What are the major rules differences? We’re answering every question. The Head Ball Coach is back, this time as the star attraction for the Orlando Apollos. And while it may be a new league, it’s going to be the same high-flying offense he’s known for. The Alliance of American Football has a 2019 launch date, a TV contract, an eight-city blueprint and a vision for a league alongside the NFL. Players aren’t getting rich — not on their three-year, non-guaranteed contracts worth $250,000. But it is a potential path back to a more lucrative payday. For the majority of the 416 players on the eight AAF rosters, they hold out hope of one day reaching the NFL again or getting there for the first time. Almost everyone here — coaches, players, general managers and even co-founder Bill Polian — has been waived, fired or gone unsigned during their football careers. At some point, the NFL told them they were not good enough. And yet, they still want to play. “That’s why I call this league ‘football in its purest form’ because money hasn’t affected this the way it does in professional football or other sports,” said San Diego coach Mike Martz, one of the few with little desire to return to the NFL. “It’s just enough. You’re playing this game because you love this game and you like to keep playing it. Denard Robinson was home in Jacksonville, Florida. NFL teams stopped calling a long time ago. Once a star quarterback at Michigan, Robinson converted to running back because he wasn’t an accurate enough passer and the league had yet to embrace the type of offense in which he thrived with the Wolverines. Robinson lasted four NFL seasons, but he hadn’t played since his rookie contract with Jacksonville ended in 2016. He had workouts — notably with Chicago and the Jets in 2017, where he said New York tried converting him to cornerback — but no one signed him. He appeared retired even if he wasn’t. Then his agent called and told him about an upstart league. He was unsure. The CFL had called, but he had turned them down. The combination of pay, tax rates and being in Canada, far from his young son, was not palatable. This new opportunity was closer. The money was decent. But he knew nothing about the AAF. The 28-year-old was sick of sitting on his couch in Florida and flying to Michigan to do the occasional appearance. Yet Robinson wasn’t fully ready to pursue post-playing plans. He had sketched out potential playbooks to use if he pursued coaching and had written his thoughts and memories down for a potential book about his life and his time at Michigan, where he’s still revered. He was still uneasy about it. Robinson dropped 25 pounds in two months to reach 215. He wants to get down to 200 pounds eventually, though he might never return to his old weight again. Along the way, he figured this was a real chance. The NFL might see his tape. Give him one more shot. If it doesn’t, he’ll play for two seasons, turn 30 and use it as a potential bridge to coaching. It would allow him to end football on his terms. He already began mentoring the younger backs on the Atlanta Legends — much like Maurice Jones-Drew and Justin Forsett did for him when he was drafted by the Jaguars. He’s offered younger players who haven’t experienced the NFL little tricks of pass protection and footwork he was taught as a rookie. His offensive coordinator in Atlanta is Michael Vick, one of his boyhood idols. His head coach was supposed to be offensive guru Brad Childress. But by the end of the first week of training camp, that changed after Childress abruptly resigned. This isn’t the NFL. Robinson knew that. In a league of first chances and last chances, his new coach was finally getting his shot. Kevin Coyle walked onto the field at the Dub Farris Athletic Complex in San Antonio for the Legends’ fourth practice of training camp. He didn’t know that by the end of the day, he’d be coaching the team. He had planned on coordinating the defense. Yet Childress wasn’t there. Coyle was told to run practice. Things happen — he didn’t think it that unusual — so he conducted the workout. “Came back that afternoon expecting that it was probably going to be something that was ironed out by the time we came off the practice field,” Coyle said. “Obviously it wasn’t. Things happened extremely fast. He’s describing this while sitting in the M Club of the San Antonio Marriott Northwest, where his team stayed for a month during training camp. The Pro Bowl is on the television screen behind him. They are a long way from that. Their meeting rooms are in the Sam Houston ballrooms — the offense is in Salon C — and a curtain separates them from a hallway doubling as the makeshift equipment room. A sign for weigh-ins says they took place earlier this morning in the hotel’s fitness center. The 63-year-old had been a defensive coordinator with the Miami Dolphins, Fresno State, Maryland, Syracuse, Holy Cross and the Merchant Marine Academy in his career — and this wasn’t how the Staten Island, N.Y. native thought he’d land a head-coaching gig. A career assistant in his possible last chance coaching football ended up with his first shot leading a team on his own. Still, he compiled notes on what he’d do if it ever happened. The night of his unexpected promotion, he took out a calendar blotter, stared at the days and mapped out his vision — one a little different from Childress’. Coyle added a boombox for music during stretching. Shifted practice times. Altered scheme. Coyle knows his hiring was a change. But everyone in this league knows glitches will happen; player after player on team after team referred to it as a startup business instead of a nascent football operation. This just happened to be a noticeable one — Childress is one of a few coaches who left the AAF. The others, like San Diego offensive coordinator-turned-Dallas Cowboys quarterbacks coach Jon Kitna, had NFL or major college jobs to go to. And that’s a goal of the league — graduate people to better gigs. Malachi Jones has never played in a regular-season NFL game, but he’s seen enough football to believe in this league. The son of former Notre Dame captain Andre Jones, godson of Raghib Ismail and brother of Detroit Lions receiver TJ Jones, he’s seen the game at its highest level. His own path is complicated. After four years at Appalachian State, he was in training camp with the Atlanta Falcons. After being cut, he played in the National Arena League, where he was 2017 Rookie of the Year for the High Country Grizzlies. He signed with Albany of the Arena Football League last year, earning Rookie of the Year and Receiver of the Year honors after a 1,156-yard, 29-touchdown season. Days later, he signed with the Chicago Bears at the start of training camp. Childress, then a Bears offensive consultant, told him about the AAF. The coach said he should play in it if he were cut by Chicago, which he eventually was. Jones, who made little money in the AFL (between $20,000 and $40,000) and worked part-time at his mother’s school in the offseason, saw joining the AAF as a multifold opportunity: Make better money. Get better tape. Play outdoor football. He considered sticking with Albany. He was on his way to becoming an Arena star. But the allure of making it to the NFL was too much. So he signed. He figures at worst, it’s a chance for good benefits, salary and a chance for the graphic design major to take advantage of the league’s offseason educational and internship programs. This league is giving him what it’s providing so many other people in it, from coaches to general managers to players and even support staff: Another shot at the top. “It’s all about hitting the right team at the right time,” Jones said. “Not saying that the organizations I was with prior, that I wasn’t good enough to play there or whatever it may be, but I wasn’t the right fit at the right time. That’s the dream of the Alliance of American Football.